This past Monday a federal judge, using scathing language but restrained authority, ruled against the NSA in a lawsuit regarding that agency's phone records collections. Stating the obvious, he declared his belief that the NSA's behavior is "unconstitutional". While the ruling was front-page news for virtually all media outlets, It is unclear what, if any, action will result. I don't have a time for the actual ruling, but the astrology for the date is instructive. Here is the USA Sibley chart with transits and progressions for Monday. Transiting Pallas sextile USA Sun, semisquare USA Mercury, and square USA Ascendant/Descendant axis: the nation gets a triple dose of the libertarian non-aggression principle as represented by Pallas. Transiting Saturn, Jupiter, Mercury, and Moon all forming aspects to USA progressed Mars: work (Saturn), publicity (Jupiter), dialogue (Mercury) and general attention (Moon) regarding the actions (Mars) of the state. Transiting Chiron conjunct progressed USA Sun (ruling the Ninth): Repair/adjustment (Chiron) of self/public-image (Sun) in the area of public service (the Ninth House, in Leo and therefore ruled by the Sun). Transiting Mars at the USA MC, square Venus (ruling the Tenth) and Jupiter (ruling the Ascendant): Battle (Mars) regarding authority/government (Tenth House) and its ability to act (Ascendant). Here is the authorization chart for the creation of the NSA, with transits and progressions. Transiting Saturn, Jupiter, Mercury, and Moon all forming aspects to NSA Uranus, Saturn, Jupiter, Mercury, Ceres, and the Nodes: work (Saturn), publicity (Jupiter), dialogue (Mercury) and general attention (Moon) triggering disruption (Uranus and probably Ceres) regarding publicity (Jupiter) and communication (Mercury), authority (Saturn) and possibly altering its destiny (the Nodes). Transiting Sun trine NSA Pluto: shining the light (Sun) on power (Pluto), so to speak. 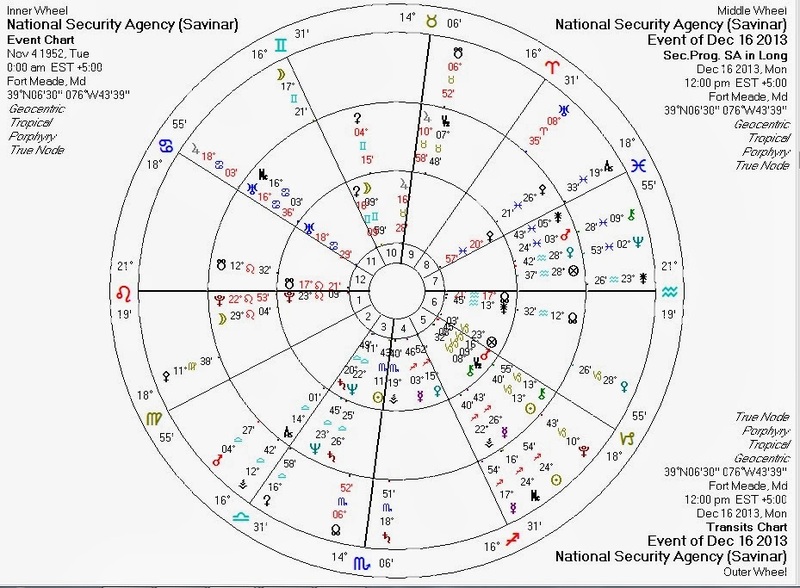 Here is the chart which Matt Savinar insists is the only correct chart for the NSA, with transits and progressions. Interestingly, it's much the same story as with the authorization chart. 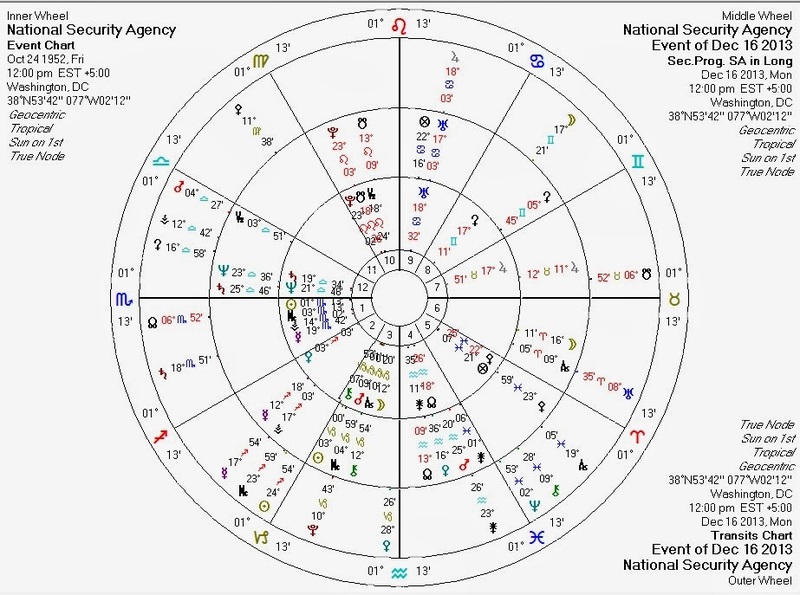 A sextile between Pallas and the NSA Sun replaces the septile of the previous chart. 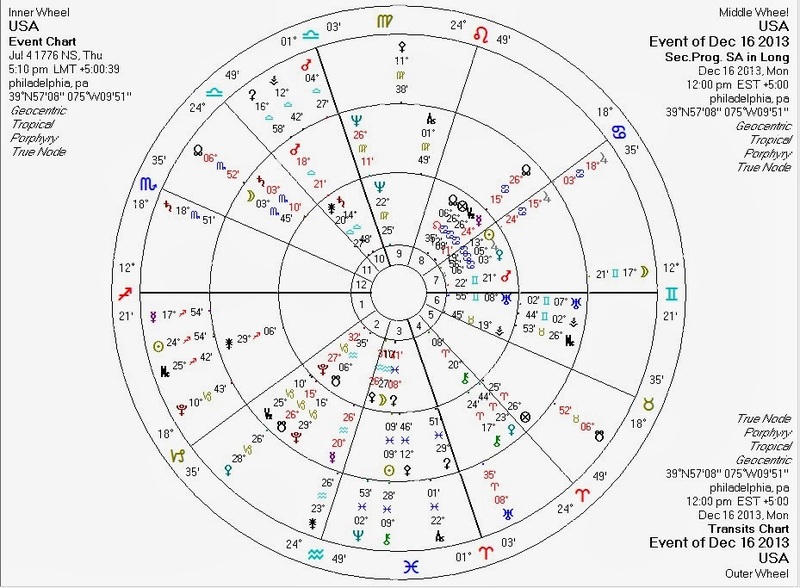 The Saturn-Jupiter-Mercury-Moon dog-pile on the chart hits many of the same points as on the authorization chart, minus Mercury and Saturn and weakening the Jupiter connection. Both NSA charts work well for this event: there's no "slam-dunk" like a transit to an angle to suggest a clear winner. Either way, with the Nodal themes there's reason to believe that some changes may have to occur in the NSA's systematic violation of the privacy of all Americans.